When I went to bed last night, I was a little discouraged. The brief weather window Environment Canada had previously predicted had evaporated, replaced with a gale warning for the next several days. I thought we'd be stuck. The NOAA forecast didn't agree. It said the weather would move in about 12 hours later, and we'd still have our opportunity to cross. It wouldn't be a flat calm crossing, but 10-20 knots and 3 foot chop on the stern isn't bad. I woke up at 4:30 a.m. and looked at the forecast. Environment Canada had amended their prediction once again: our window was back. I checked the Central Dixon Entrance weather buoy: 9 knots, gusting to 13, 3 foot seas. Green Island lightstation reported 16 knots of wind and 3 foot moderate sea conditions. Not ideal, but tolerable and perfectly safe. Armed with this information, I made the go decision and commenced waking up the entire fleet. Not the most fun job at 5:00 a.m.
At 6:00 a.m. we slipped away from the dock and headed for Venn Passage. Venn Passage is a narrow, shallow, winding waterway. It's well charted and well marked, but requires careful navigation. The advantage is it cuts the distance to Ketchikan by about 12 nautical miles, or about an hour and a half in a boat like mine. Several of the boats were nervous about transiting Venn Passage, so we went single file, Safe Harbour leading the charge. We all made it through uneventfully, never seeing water less than 18 feet. Once into Chatham Sound, seas picked up. We had about 15-20 knots of wind from the south, and three foot chop. The autopilot got a workout, but most of the day was reasonably comfortable. I napped, showered, and flew the drone, so it wasn't that bad. Event Horizon in Dixon Entrance. A bit bumpy, but not bad! 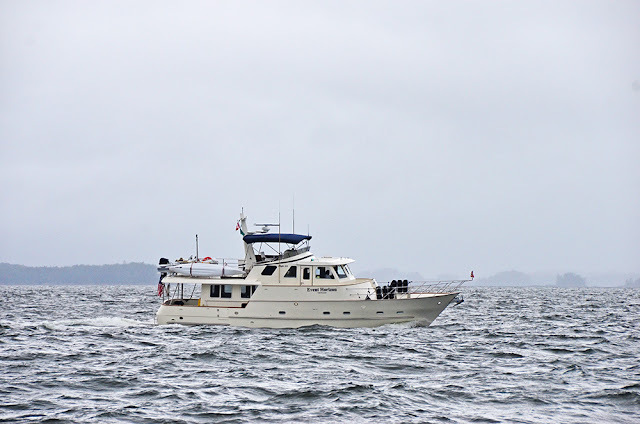 Usually I break up the 82 nautical mile run from Prince Rupert to Ketchikan with a stop at Foggy Bay. 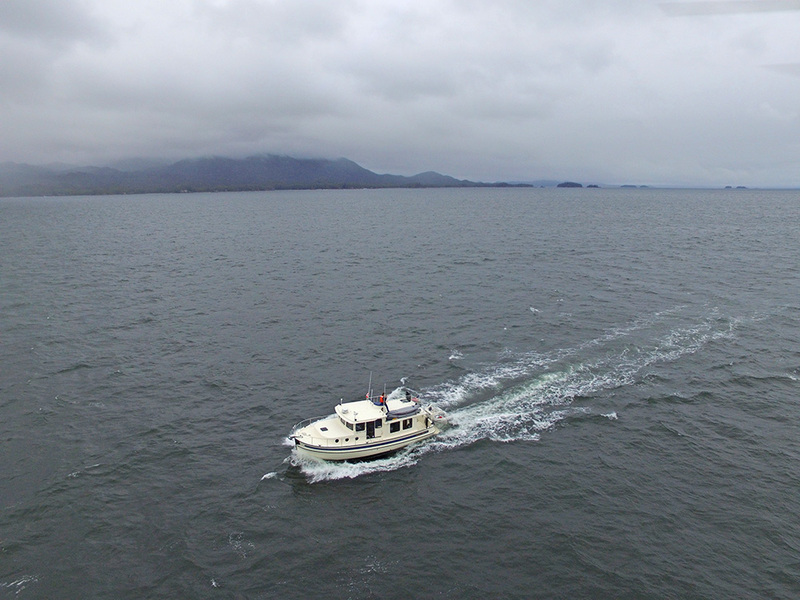 Because of the predicted weather, we skipped Foggy Bay and headed directly to Ketchikan. Another long day. We cleared U.S. Customs at the fuel dock. Ketchikan customs agents are AWESOME! Apparently recognizing that Southeast Alaska has no agriculture, they don't concern themselves with citrus or apples or any other food items. Have prohibited food on board? No worries, welcome to Alaska! At the fuel dock I put on 209.43 gallons of diesel at $2.25 per gallon. Since the last fill, I've clocked 100.12 engine hours and traveled 727.98 nautical miles. That means I'm getting 3.48 nautical miles per gallon, burning 2.09 gallons per hour, and averaging 7.27 knots. Pretty good economy for a 40 foot powerboat. 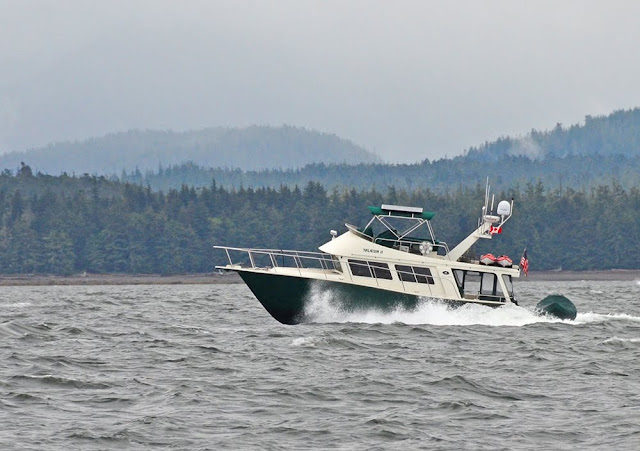 Below is a video I put together of the five "gates" on the trip up the Inside Passage. These are the areas that cause the most worry and have the most potential for danger. They're particularly susceptible to serious weather and currents. As you can see, we had a pretty easy trip! Time to catch up on chores and wait out the weather. North again in a few days.